Not all places give you the opportunity to experience adventurous activities in both desert and the sea. The Khor Al Adid allows you to experience both. 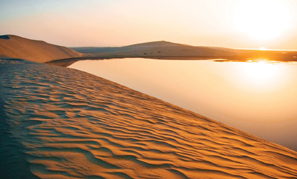 The UNESCO-recognised natural reserve is a rare example of the sea jutting deep into the heart of the desert. For a heart-stopping roller coaster ride over the steep dunes, try a 4×4 off-road safari and, if you are feeling particularly adventurous, hire a dirt bike. Or have a go at camel, sand boarding or driving a dune buggy. Do not forget to watch camel racing- ‘the sport of the sheikhs’, where you can watch robots whipping the camels, with owners and spectators following along in their 4-wheel drives.Many safaris take in the spectacular ‘Inland Sea’ and the chance to enjoy glorious desert sunsets and moonlit barbeques. Daytime, evening and overnight camping trips; take your pick. With no sign of civilisation, it is a place of stark solitude. All the shopping stories in Doha begin at Souq Waqif that stands for ‘standing market’. A promenade in the bustling alleys of Doha’s first major market provides an authentic taste of traditional commerce, architecture and culture. The maze of small shops offer a dazzling array of Middle Eastern merchandise from spices and seasonal delicacies such as fresh dates and nuts, to perfumes, ornate jewellery, clothing, handicrafts and a treasure trove of souvenir bargains. The city is filled with malls. They say for a population of nearly 3,00,000 there are 100 malls. Villagio Mall finds a place in Forbes magazine’s ‘best malls of the world’ list, followed by Mall of Qatar, Doha Festival City Mall and the Pearl-Qatar where you can relax and soak up the vitality and atmosphere at one of its eclectic mix of restaurants and cafes.You can even book a private one day shopping tour and be chauffeured around the city’s retail hotspots. “A visit to the Villagio Mall is a must. It looks like Vatican City with a man-made inland lake. One might find a stark similarity to it with the Bollywood movie Saawariya,” says Lamiya Mohammed, a blogger based in Qatar, who goes by the name “thelittlehijabee”on Instagram. 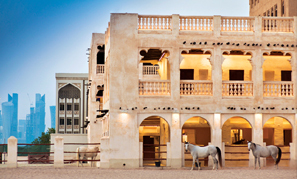 For a glimpse of Qatari heritage, a visit to the Falcon SouqMarket in Doha is a must. You will find customers examining the birds – most of them hooded in black leather, and perched on posts or railings – and discussing the finer points of falconry with the shopkeepers. The city is home to numerous museums and galleries. Besides the incredible Qatar National Museum, check out the Sheikh Faisal Museum that displays the private collection of random artifacts of a Qatari billionaire. 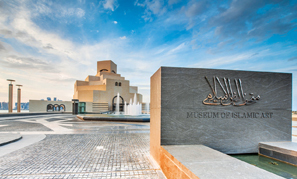 The Museum of Islamic Art (MIA) boasts a world-class collection of art spanning 14 centuries and is one of the leading collections of Islamic art in the world. 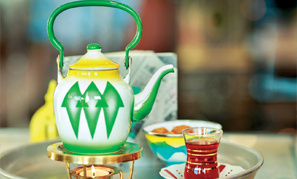 Its award winning collections include paintings, glassworks, metalwork, ceramics, textiles and manuscripts. To experience Qatari food and Arabic coffee, head out to either Souq Waqif or Katara Cultural Village—the sheer variety of traditional cuisine here wil surprise you. The Qatari’s favourite food is roast camel, roasted on a BBQ is the best option. Over the years, local dishes have been influenced by the cuisine of the Indian Subcontinent, Iran, the Levant and North Africa. They include-Balaleet, cooked sweet noodles with fried eggs spiced with saffron and cardamom; a traditional sweet and savoury dish that is well-known as a local breakfast meal. Lunch or dinner meals includes machboos, a stew of richly spiced rice with seafood or meat; ghuzi, a whole roast lamb on a bed of rice and nuts; and stuffed boiled sheep or goat served with seasoned rice. The region’s favourite dessert is Luqaimat, a deep fried sweet dumpling drizzled with sugar syrup. “Located on Qatar’s north-west coast and comprising the immaculately restored Al Zubarah Fort and surrounding 60-hectare archaeological works, this UNESCO World Heritage site is the only remaining example of a complete Arabian pearl merchant town. It is one of the most extensive and best preserved examples of an 18th–19th century settlement in the region,” says Joe Fernandes from Aviareps, the India representative of Qatar Tourism Board. Also, a visit to Zekreet known for its beach and film city and the stunning “East-West/West-East” sculpture by Richard Serra, an American artist known for creating imposing metalwork sculptures in the desert is a must.The site has become a place of occasional pilgrimage for locals, tourists and art devotees alike. “One of my favourite things to do in Doha is go and visit the Aspire park (Doha’s biggest park), where one can sit and relax and enjoy the view of the magical bridge and the Aspire tower especially in the evening. Also I love to sit at the corniche, late at night and enjoy the view,” adds Lamiya. 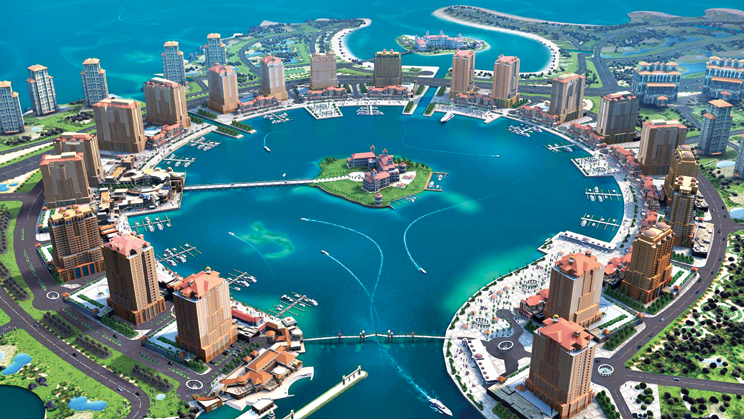 • 99 pc of the country lives in the capital of Doha, since the other part of the nation is just desert. • Doha is home to the world’s first and largest underground stadium, called the Wall Stadium. • The Doha Festival City Mall is home to over 200 international brands, the world’s largest Monoprix Hypermarket, Middle East’s first NBA Store, and the world’s first Angry Birds World Theme Park. • Mall of Qatar is home to the world’s first alcohol free Curio Collection by Hilton, an IMAX Laser 3D projection system, KidzMondo, the mall also includes live entertainment as part of ‘MOQ Live’, making it the world’s first mall to recruit an in-house theatre crew. The Doha Marriott has a 100-metre buffet that offers anything you can imagine.